I see things differently now I am sober. Today is the 196th day of continuous sobriety. The last time I drank was on 11th March 2016, on a Friday night. And predictably I got so plastered I could barely walk home. I’m ashamed of being that person – (can you see a theme in my last posts, because I certainly can) who dragged her family and friends out for a pizza and then got completely drunk. I see my children with new eyes, I see their struggles and the support they need more intuitively – I guess it makes sense, if you (I) are fully THERE, I’m likely to pick more things that are important. I still have a problem I think with boundaries with my kids, I don’t for example really know how much to share with them about my relationship breakdown. They are acutely aware of it – how could they not be – and we have talked about it – but how much do they need to know? how much is it appropriate to share ? how much of my internal struggle should they know ? I think its good for kids (teenagers) to know that adults don’t have all the answers; I think its good for them to know that adults make mistakes and have regrets, I also don’t want them to think I regard relationships / love as easily expendable. I don’t want them to think that I ? we didn’t try to work through our problems. 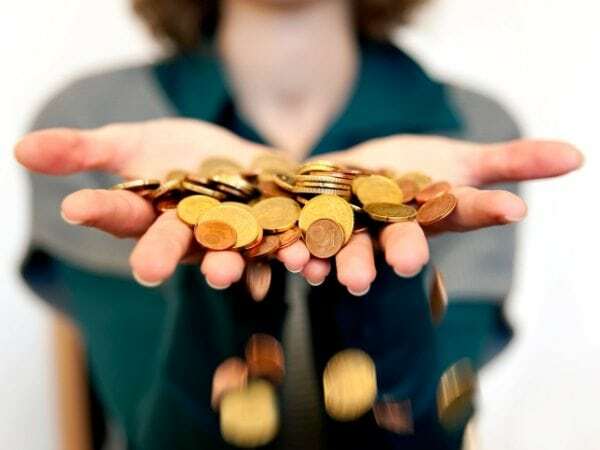 If I am to ask for their help – which I need if the house is to keep running – then they have to understand some part of my struggles.. but how much ? How much to share about the decision to stop drinking? we are planning an 18th birthday party for my eldest son. I will order alcohol for my guests but I will not drink – he asked me if I would as its a ‘special occasion’ and seemed surprised when I said that I would not. how much should I share about my decision that for me. moderation was impossible and sobriety ultimately the only option. My new eyes are kinder to me (you might not believe it, but its true and I have invested in personal therapy for me as a way to help ME. Not for anyone else, for ME. here are several other demons I need to deal with, and many pot holes to avoid in this journey. I’m pleased, I think, with my progress so far. I feel the capacity to love and to care for my patents, my friends, my colleagues has increased since I became dry. I have more headspace although I’m very distracted since ExP left. 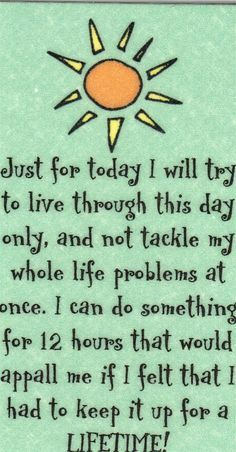 My sobriety remains my priority, although I honestly don’t THINK about it much day to day any more. I think. hope, I’m aware of triggers that could derail me, and have strategies to manage them. 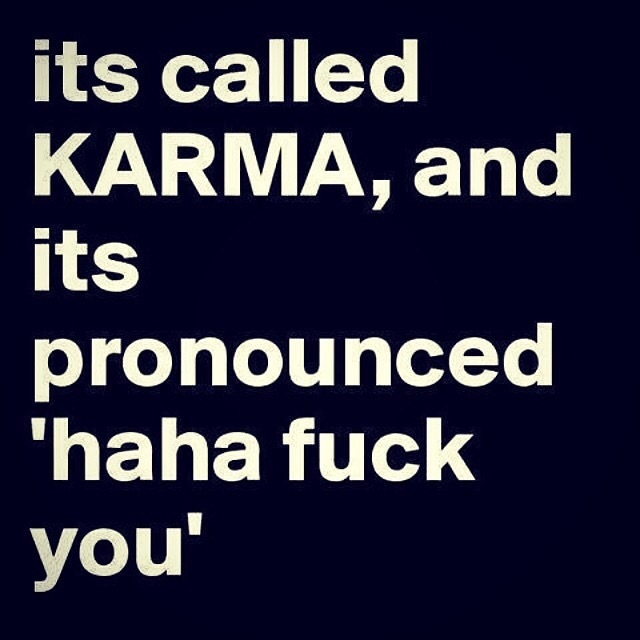 Following on from my post about yoga a couple of days ago, I’ve been musing about that attractive concept of “Karma”. At least I find it attractive – believing myself to be fundamentally nice, kind,honest and helpful I beleive(d) that my karma would be good, and some people who have hurt me, or wronged me would, at some point get their just “comeuppance” Very satisfying, natural justice delivered by some all seeing deity or force of nature …. And then I discover that the philosophy of yoga incorporates this universal spiritual concept of reaping what you sow: the law of Karma. Yes, simply put, Karma is the future consequence of one’s current behaviour, but not JUST your Behaviour- also your intentions, thoughts, and actions. Hmm, so all those angry thoughts also get weighed up on the giant karmic scales ? There is also the slightly sticky thought that a big chunk of your karma comes from how you behaved in previous lives (for faiths that beleive in reincarnation) which you will neither remember not be able to add to your internal karmic scales … Meaning our lives are controlled completely by our own self-created karma; the actions we do in this lifetime, (as well as what we have done in all our previous lifetimes, which are many in number). However, much of our karmic influences lie hidden in the subconscious part of our minds, which is where all our karmic actions are recorded. So it’s past lives and subconscious thoughts that are the main influences …. Hmm , the theory goes that these actions, or karma, determine what happens in our lives today, especially as these actions have been repeated over many lifetimes. So, while the Karma you currently create (with your thoughts, actions intentions and behaviour) influences your future life experiences, (the theory goes) your Karma is not your fate. 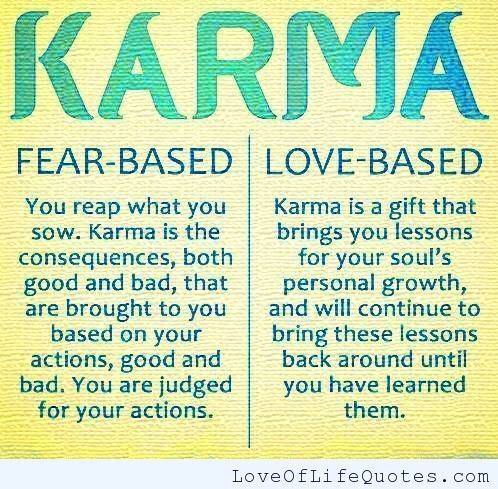 It’s central to the idea of karma that one has the ability to consciously choose how you respond and react to Karmic generated events, thus reducing the current impact of your Karma and reducing or eliminating future Karma. Got that? This is what yoga is supposed to do – free you from the accumulation of more Karma, good and bad. Good Karma is good, bad Karma is bad, but attaining any kind of Karma is undesirable. The goal, through the practice of yoga, is to stop the cycle of Karma by ceasing further Karmic accumulation. The yogis tell us the only way to not produce Karma is to act selflessly, without ego, without the desire for any reward. Yoga , and the meditation involved helps us to achieve this goal.. The more conscious we are about how we live our lives and the choices we make, the more we will be able to guide our lives in a particular way. But it is only when we begin to choose the spiritual life that we finally find the fulfillment and happiness we have sought in all of our previous lifetimes. Like yoga, this is both a psychological and physical practice, with the mental attitude much more powerful than the physical deed. Liberation from Karma is known as Nirvana, and is a highly esteemed spiritual state. But striving to attain a state of Nirvana is not a necessary goal; any reduction in Karma will improve one’s life, well-being and happiness. 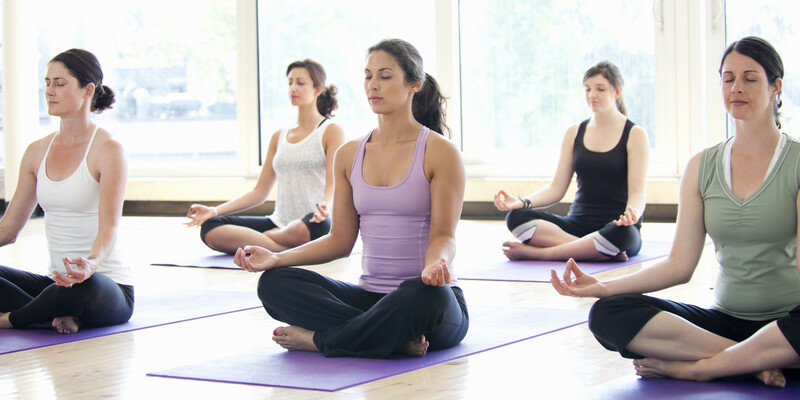 So, doing yoga will reduce your karma, good and bad … And mean you are closer to Nirvana …?. I want to believe this – like I said I find the idea attractive, and of course it means that we can and should let go of negative thoughts, feelings and emotions, which is better for us however you look at it… However I’m really not sure I’m getting the connection between an unsupported half moon and a better life. Around 1 in 11 men and 1 in 25 women are physically dependent on alcohol. Sorry For yesterday’s “post of rage” – I was not in a good place. Yesterday evening I went to a gig. See above. A tribute band. I went with a friend and colleague who is having a tough time at the moment. Given how I was feeling yesterday, and how vulnerable to lapse I was, I would have probably stayed at home if I had not asked R to come with me. Given her troubles, I really didn’t want to let her down. There was, as always, lots of alcohol outlets at the venues. Pretty much everything I had been lusting after earlier in the day. There were a lot of middle aged folk, with bottles of wine, having picnics and getting drunk in the sun. We found a spot on the lawn, got a coffee (and I had a HUGE cake) … And relaxed. I honestly didn’t feel the need to drink, and I wasn’t seriously tempted. We had a great evening. R was able to relax and enjoy herself; we sang and danced and waved and shouted and cheered with the best… I feel I did something good and thoughtful in offering R the extra ticket, and that also cheered me. I didn’t drink, I didn’t need to. I have been musing about the rates of addiction in doctors. I was taught, many years ago, that doctors had a higher rate of alcoholism and of suicide than the general population. The BMA estimates one in 15 medics have a problem with drugs or alcohol at some point in their life-time. Doctors, as a group, are reluctant to face up to their problems, most are good at hiding it. The ever present fear of the regulatory bodies taking away someone’s livelihood is a strong motivator for doctors to keep quiet and not seek help. Doctors are known to be at least three times as likely to have cirrhosis of the liver than the rest of the population. This is second only to publicans and bar staff. Doctors are routinely faced with breaking bad news, and are in frequent contact with illness, anxiety, suffering and death. In day to day practice we deal with many illnesses that cannot be cured, but there are also high expectations from which can put unrealistic pressure on doctors. Aggression from patients is an infrequent, but unpleasant experience. The emotional demands of working with patients can be a major stressor. Do doctors turn to alcohol (most commonly) or other drugs to relieve stress just because it’s very stressful – rather than because innately people with addictive tendencies choose to be doctors? For junior colleagues, when maybe the patterns and habits of dealing with stress are formed, you can add heavy workload and long working hours with long shifts, weekend working and sleep deprivation. Quite often there is lack of cohesive teamwork and social support, leading junior doctors to work individually (whereas working in teams is associated with being better able to cope with stress). Many of these occupational risk factors are intrinsic to the job. Some studies suggest that the difficult and emotionally demanding job of a doctor frequently leads to doctors being self-critical. The typical personality traits of many medical professionals, such as perfectionism, can lead individuals to become increasingly self-critical which can increase stress and lead to depression. Some practitioners have unhelpful coping strategies (e.g. emotional distancing, rather than actively dealing with stressors) which may add to psychological distress. Other psychological vulnerabilities common in physicians have been identified, including an excessive sense of responsibility, desire to please everyone, guilt for things outside of one’s own control, self-doubt and obsessive compulsive traits. Mental ill health in doctors cannot simply be due to occupational stressors, as if it were, a much greater percentage of healthcare professionals would be mentally ill. It may be the case that workplace risk factors can lead to mental ill health in vulnerable individuals – in other words, occupational risk factors combine with pre-existing personality factors to create psychological distress. 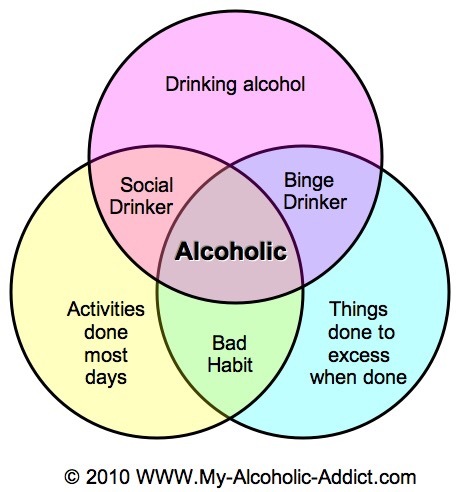 Alcohol is a ubiquitous tranquilizer, it’s there in every social experience, Do I think I have an alcohol problem because I am a doctor – No. In fact I think during my early career the fact that I worked every third night, and every third weekend probably capped my drinking because I have never drunk before or whilst on duty. Do I think the stresses of my career have added to my tendency to drink excessively? Yes, but I don’t think it’s unique to medicine, I think If I had been a lawyer or a teacher I would have had the same characteristic traits and the same inclination to drink. I think the ‘lack of an off switch’ is inherent – and would be there whatever occupation I had chosen to follow. Much more to read, and much more to ponder on. Just as a last, today we had notification that a patient, aged 44 was found dead at home. He was an alcoholic who failed, despite numerous efforts, (residential rehab included) to quit drinking. When we run an audit of premature deaths in our practice approx 2/3 of all deaths below 65 are drug or alcohol related. Sobering statistics.